Just when you thought an OREO couldn't get any better, they have to go and make a Birthday Cake version! I am IN LOVE with these cookies. They are so stinkin good and just blow my mind everytime I eat one. It starts off by saying, I just want one bite . . . then two bites . . . then three cookies later I finally decide I better wait a few hours before I eat more. The frosting is TO-DIE-FOR. It kinda reminds me of the flavor of bakery frosting, that I have been searching and searching for a recipe for forever and the texture is beyond creamy. Your family and friends will go nuts over these. Preheat oven to 350 degrees. Combine cake mix, eggs and shortening and mix until well blended. Dough will be very thick. Roll into 1'' - 1 1/2'' balls and place on a lightly greased cookie sheet. Bake for 9-10 minutes. Tops will be cracked. Cool completely. Yield: around 3 dozen cookies or 18 sandwiches. In a medium mixing bowl, beat butter until creamy. Add the dry cake mix, vanilla extract, almond extract and a pinch of salt. Mix until combined. Begin adding powdered sugar, one cup at a time. Add milk as you go to reach desired consistency. You may or may not need all of the milk. 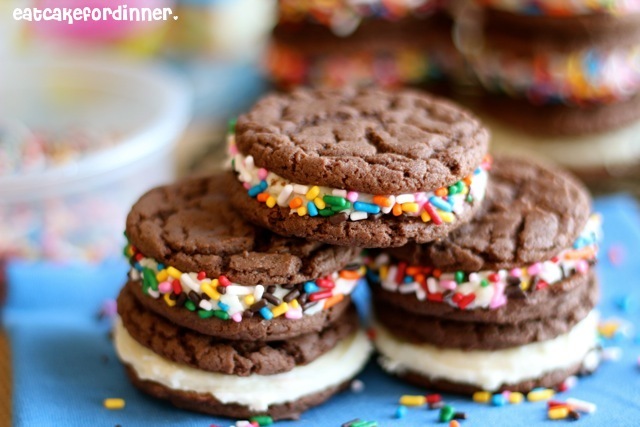 Spread frosting over one side of half of the cookies and top each with another cookie. Roll in sprinkles, if desired. Makes enough to generously fill 18 sandwich cookies. Jenn's Notes: These are perfect. Make them now. *Update 5/29/13 - Since I posted this recipe I tried the real Birthday Cake OREOS and they tasted like they have butter flavoring in them. I think if you added butter extract to this frosting recipe, they would taste just like the real thing. LOVE these. They are SO pretty too! They do look yummy.Better try them soon. Wow! I'm not sure there is anything better than a homemade Oreo! We can't wait to try these!!!! Thank YOU! Let me know what you think if you end up making them! Wonder if I could substitute vanilla or yellow cake mix to approximate the flavor of the Golden Birthday Cake Oreos? These look amazing!! 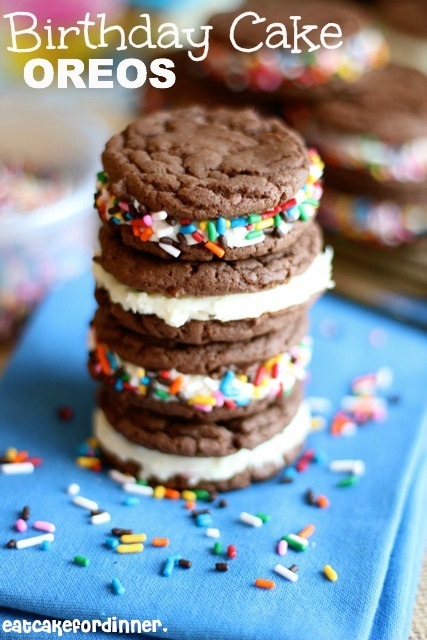 I love the idea of birthday cake oreos! These are totally adorable! I love the look and sounds of that frosting too. I adore using almond extract in frostings. Love the little pops of color--such a wonderful sugar fix! I am going to give these a try! I am a new follower from southern charm! I would love for you to check out my blog and hopefully you will want to follow me back! Happy weekend Nicole! Let me know what you think. Thanks for following!